Alfonso Cuarón’s outer space disaster thriller Gravity is sort of like Apollo 13 reimagined as a Die Hard movie. It’s ultimately a theme park ride disguised as a movie, an IMAX 3D event that is entirely reliant on technical virtuosity. Sure, it’s an often thrilling viewing experience. It just left me feeling a little empty by the time its 90 minutes wound down. Despite the breathless accolades Gravity has been garnering (“The best space film ever done,” according to James Cameron), any movie that places sheer F/X spectacle ahead of everything else is bound to fall short of true greatness. The set-up is deliberately humdrum, as astronauts are seen going about routine business outside their Space Shuttle. Dr. Ryan Stone (Sandra Bullock), uneasy during her maiden space mission, and Matt Kowalski (George Clooney), carefree during his career-closing mission, are working on a Hubble telescope repair. They get an urgent message from mission control in Houston that, following a shoot-down by the Russians of their own dead satellite, a chain reaction of satellite collisions has been set off. Ryan, Matt, and several additional crew members must close up shop immediately before the debris storm silently collides with them at 20,000 mph. If you’ve seen the numerous pre-release trailers, you know the debris does slam into them in spectacular, disastrous fashion. Read no more if you’ve not seen the film. There’s little else to say, short of delivering a blow-by-blow account of how Ryan and Matt attempt to survive the hostile environment. Their only hope is to reach the International Space Station before the deadly space junk hurtling around the Earth makes its way back to them. Matt estimates they have 90 minutes at best. 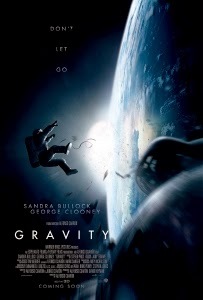 As a survival story, Gravity delivers visceral thrills in spades, no doubt about it. The experience of watching these astronauts existing in the vacuum of space—drifting untethered at times, coasting on jet pack fumes at others—is terrifyingly exciting. Cuarón, cinematographer Emmanuel Lubezki, and what I’m assuming was a small army of effects technicians have achieved one what is very likely the most realistic-looking outer space-based film ever. In that regard, Cameron’s lofty praise is justifiable. It’s relentlessly intense, without even the momentary reprieve of checking in with mission control (the multi-satellite disaster has severed all communications with Earth). But unlike the true events of Apollo 13, the level of human drama is far less compelling. Cuarón and son Jonás’ screenplay fails to make Ryan or Matt fully fleshed-out characters. We have no reason to dislike these astronauts-in-peril (and being portrayed by two of the most likable stars in Hollywood helps, too), but Ryan’s clichéd backstory and Matt’s superficial charms aren’t enough to make them indelible. They’re basically stock characters, saddled with dialogue that alternates between banal and corny. Bullock, who looks great floating around in zero-G wearing nothing but a tank top and booty shorts (at age 49, no less), even gets a few sub-John McClane one-liners (i.e. “Clear skies with a chance of satellite debris,” or even worse, “I hate space”). In the end, one’s enjoyment of Gravity is largely dependent upon one’s expectations. If you’re hoping for a soul-searching, existential meditation on the fragility of human experience, you’re in for a disappointment. If you’re simply looking for the highest of high-wire thrills, delivered with panache and state of the art tech, sit back and soak it all in. But just because it’s a great movie-going experience doesn’t mean it’s necessarily a great movie. I’m so glad someone else feels the same way I do. The visuals were breath-taking at times, but the movie never really connected with me. The measure of bad luck this one astronaut experienced in the movie reached the level of parody to me. Yes, I agree. Without the special effects, this was largely a typical B-movie disaster flick. I’m kind of shocked there hasn’t been a more balanced reaction. I actually thought it was incredible. I personally think the movie would have suffered if the characters were more developed. I’d assert that there actually could have been even less we knew about them and that the movie could have been purely about the fight to stay alive, and had no real connection to their lives beyond the scenario they experience. Maybe I am just one of the people on the Bandwagon, but I found the development to be right on point, even though at times I felt it unnecessary.